I’ve often touted the benefits of cooking, especially as a source of comfort. In times of sorrow, the smell of baked goods can heal the heart just a little. The aroma can evoke memories of meals lovingly prepared and holidays past. For at least a moment, you can fondly recall happier times and smile thinking about how you ate until you were stuffed. Sadly, my mother passed away suddenly last Friday, November 1. While we are still searching for answers as to the cause of her untimely death, she will always live on in my heart. But mostly, she will live for me in her recipes and the food she made for me. As you may recall, I’ve never enjoyed baking very much. I don’t like to follow directions carefully. Plus, my mom was such a good baker, it was not an area I felt I could improve upon. Her cheesecake didn’t crack. Her cookies were perfectly golden. Nothing was ever dry. So when the bananas in the fruit basket someone sent us were overripe, of course I heard her voice telling me to make some banana bread. And my mother would have been proud of this perfect loaf. So in her honor, I will share her recipe with you today. Preheat oven to 350 degrees. Grease with some shortening a 9x5x3 loaf pan (preferably glass). In a large bowl, combine all ingredients except chocolate chips and walnuts. Mix over medium speed until combined. Stir in chips and nuts. Pour into loaf pan. Bake uncovered for 60-70 minutes or until toothpick inserted in center comes out clean. Cool 10 minutes. Flip over to remove from pan. Continue to cool on a rack. Serve with cream cheese. 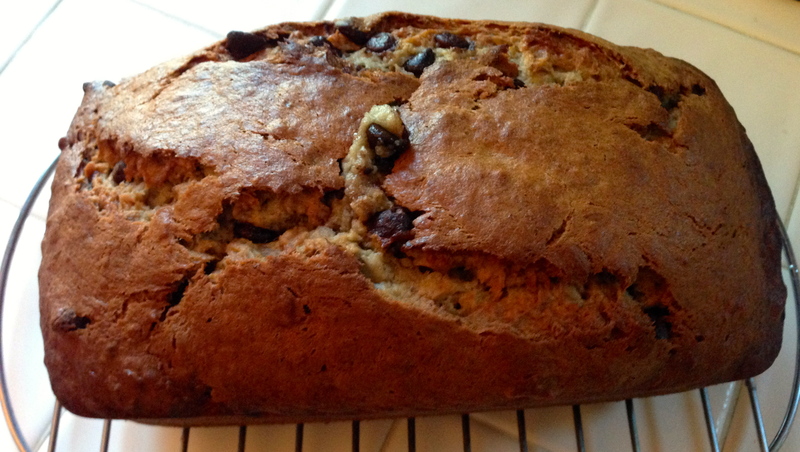 Banana bread is one of those perfect winter comforting foods, or any season really 🙂 Thank you for sharing this recipe and sorry about your mom’s passing. Hugs.